On the surface, this seems like a ridiculous question. Strawberries are a fruit, after all, not a grain (let alone one of the three gluten grains). But enough people with celiac disease and non-celiac gluten sensitivity report being glutened by strawberries (or at least suspecting that strawberries were the culprit in their symptoms) that it's worth investigating where gluten cross-contamination might creep into the strawberry food chain. The answer, as it turns out, isn't hard to find. The delicious bright red berries we know as strawberries weren't named randomly—they're traditionally grown on beds of straw, both to shelter the young plants from chilly temperatures as they lie dormant over the winter, and to keep the fruit itself clean when it's close to ripening. Several different types of straw can be used, but many experts in strawberry cultivation recommend the use of wheat straw. Alternatives include rye straw (yes, rye is another gluten grain) and oat straw (oats, of course, are problematic for some of us). These days, it's more common for farmers to use plastic instead of straw for growing strawberries. Nonetheless, some farmers do still use straw, at times in combination with plastic. Farming practices vary from region to region and from farmer to farmer. Therefore, some strawberries (but not all) are in close contact with gluten grain straw during the entire time they're grown. This appears to lead to enough gluten cross-contamination to make the most sensitive among us sick when we eat the berries. The skeptics among us will point out that the gluten in the wheat plant is contained in the grain kernel, not the straw. The kernel is separated from the straw stalks by the combine during the harvesting process... and so the straw ought to be gluten-free. However, anyone who's seen wheat being harvested knows that it's a profoundly dusty process, and some of that dust contains gluten. As the mechanical combine separates the kernels from the wheat stalks, it inevitably crushes some of the kernels. The dust from these crushed kernels gets all over the straw (and the field, and anything around it, depending on the wind). Therefore, the straw is cross-contaminated, albeit to a very small extent. It's worth noting that this type of cross-contamination is also a problem for mushrooms, which frequently are grown on rye straw. Let me stress that not everyone is sensitive enough to gluten to react to strawberries—this appears to be a problem only for those on the more sensitive side of the celiac disease/gluten sensitivity spectrum. But it's enough of a problem that it's definitely worth mentioning, since knowing about it may help you trace a mystery glutening. Washing your berries may help some, but unfortunately, gluten is a very sticky protein that doesn't dissolve in water. We're also talking about microscopic amounts of gluten. Therefore, washing may reduce the cross-contamination some, but you may still react. Of course, have you ever tried really scrubbing ripe strawberries? You're likely to wind up with a glob of pulp in your hand. If you're unlucky enough to react to strawberries, you still don't need to give them up forever just because they're often grown on gluten grains. But you'll need to do some detective work. Farmers in different regions use different practices to grow crops. 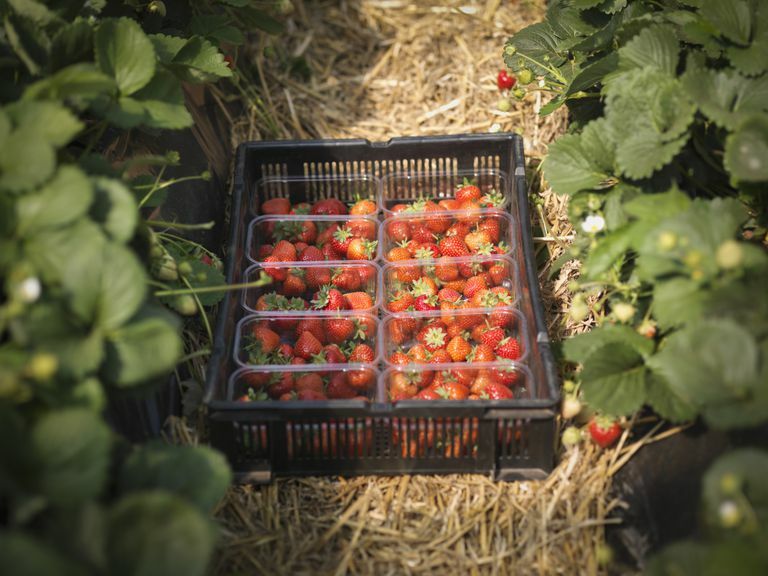 It's possible that the farmers in your area don't bed their strawberry plants in straw—many farms have moved to the more modern method of using plastic-covered mounds of soil or mulch to grow strawberries. So ask around—you might have good luck at farmers' markets finding growers with berries who don't use straw at all (and as a bonus, their strawberries most likely will rank among the best you'll ever taste). I've also seen reports that some brands of strawberries found in the supermarket (Driscoll's, for one) are always grown on plastic. However, use some caution here: large vendors like Driscoll's contract with many different farms, where growing practices may differ. In any event, with some careful investigation, you should be able to find strawberries you can eat, even if you're exquisitely sensitive to gluten cross-contamination in your food. If Mushrooms Are Gluten-Free, Then Why Do They Make Me Sick?